Public sector waste: "Mr Redwood said his review would "freshen up" the work on efficiency savings already done by Sir Peter Gershon, the government's former efficiency adviser, and David James, the Conservatives' waste troubleshooter... "I think by the time we get close to 2009, there are going to be monumentally large sums of money that are not helping the individual school or hospital that we will have to spend more wisely - or not spend at all."" Tax: Mr Redwood was careful to agree with David Cameron's 'stability before tax cuts' message - "I think David is right that you first have to get people's trust over economic management and that you can't take risks with stability" - but noting that lower taxed economies generally perform better, he said this of corporation tax: "You could maximise revenues by having a lower rate than you have currently, if evidence shows that you are losing a lot of footloose business investments and opportunities because the rate is too high." On Saturday ConservativeHome reported the Reform think tank's disappointment at the Tory caution on tax. Transport infrastructure: "One focus would be to develop the transport infrastructure where "even if rail capacity doubled, it would only take care of a couple of years' growth in travel demand"." Higher education: An ambition to get five UK universities into - or rivalling - the top ten in the world. Why on earth isn't John Redwood in the Shadow Cabinet ? He talks more sense than most of those who are and was excellent on Question Time 2 weeks ago. Another case of Cameron letting the prejudices of the left-wing media set the agenda. Being on the front bench in opposition isn't where he is of most value to either party or country. Redwood is a target of opportunity for the developing critique of Cameron as Bush (compassionate conservative front to hard right neo-con led real seat of power). Cameron has shown real expertise is assigning leading policy roles across the wings of the party - giving them skin in the game. By doing so he provides them with a real opportunity to drive the new agenda without exposing the Cameron Conservative brand to attack. John Redwood can drive the creation of strong policies on the economy without the day to day interference of an opposition front bencher but still having a post of authority in the party. Exactly Ted,I think Redwood will probably have more influence on developing policy in the future than many members of the Shadow Cabinet. I think this job suits his talents as he is by no means a gifted communicator either in ther House or in the country but is undoubtedly one of our best economic brains. On Question Time he was not able to gain the sympathy of the audience in the way that Tebbit and Gillam were able to do given the problems the government is facing. Lets hope that Redwood is given more of a free reign. There is a lot riding on this economic competiveness task force. 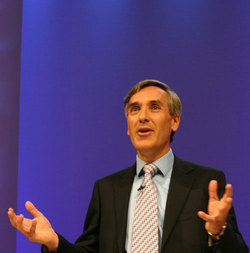 I'm a big fan of John Redwood, but electorally he's a disaster waiting to happen because of his past form. Putting him in charge of one of (if not the) most important policy review groups is the right call. (1)security: a Cameron Govmt will probably retain a Home Office, a Foreign Office and a Ministry of Defence and they'd be co-ordinated at first instance through a cabinet Sub-Committee handling Overseas & Defence matters, such as perhaps the Overseas & Defence Committee, and supported by Cabinet Office. Probably a Minister for Homeland Security (if that idea is retained) would have day-to-day responsibility. Limited structural change unless a National Security Council is established. (2)global poverty: I would expect the Dept for International Development having something to do with this. I can't see them having anything else to do. (3)economic competitiveness: the Treasury will run this and DTI will do what they are told. (4)public service reform: depends on the extent to which central targets are scrapped, but expect the bulk of the work - or, at least, the person whose head's on the block - located in the Dept of Health, Dept of Education etc. (5)quality of life (including the environment): I'd expect whoever runs Defra will get this. (6)social justice: This one's the real puzzle. If DWP doesn't get the remit there might be a new post here, perhaps chopping up ODPM (which currently has 2 cabinet ministers any way) into a smaller Local Govmt Dept and a new ministry. to which presumably add (7) democracy: which will probably fall under the remit of the Leader of the House. So, actually, not much structural change required, unless they deliberately set out to make some. In terms of implementation there's a plan already worked out for the James Review recommendations, but I can never remember whether that's still meant to be secret or not. If they just copy over that it wouldn't need a new minister. Who is on this task force that has set up a business themselves from scratch, a business that hasn't been reliant on the public sector for it's income? Cameron's genius is to move to the centre ground while launching thinktanks employing the party's best brains, of which John Redwood's is one. Right and left are becoming meaningless terms. As the public becomes interested in the return of good government, right and wrong policies achieve greater significance. While portraying the party as central, the key is to educate public opinion to see conservative solutions as of the centre. I believe Redwood to be a good communicator. He prefers slightly more detail in his message than the average voter takes in...but he is unafraid of tackling complex issues, and reducing them as simply as it is possible to do. Maybe TV audiences will grow to like him if he gets a little more exposure.